The usage of black color is just like white. It matches all colors and is a great background color! One thing black is different from white is black weights down the whole image. When wearing too much black one will look heavy in heart. It explains why people wear all black when attending funerals. Of course the style of clothes convey meanings. A stylish black t-shirt sheds a light of coolness and sometimes a tad of distance. Generally black adds to the maturity of a person. One GREAT advantage a black t-shirt has over other color t-shirts is that a black t-shirt can almost always be worn alone as top when you go out. You really don't need anything fancy. This is even more true with a Black V-neck T-shirt (see Photo #1)! What do Black T-shirts Look Great with? As mentioned a black tee can be made fashionable when worn alone. Just throw one on and throw on some silver necklace (see Photo #2) and it makes a great casual ensemble! 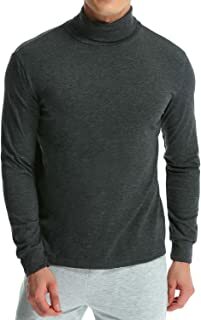 Black tee looks great with gray. 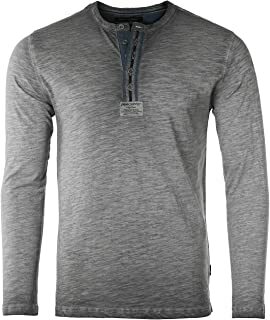 A crew neck long sleeve black tee pairing a pair of gray pants and a silver pendant compose a dapper image. Black and white being contrasting colors will need to be careful with the proportion. 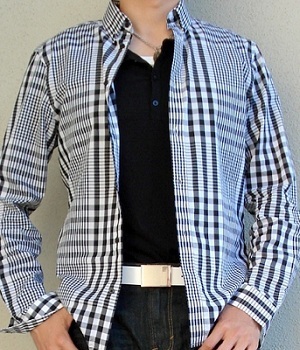 One way you can never go wrong with is pair a black t-shirt and a casual shirt (see Photo #3)! What about with Bright Colors? Is a black T-shirt good with bright colors such as blue? Absolutely. 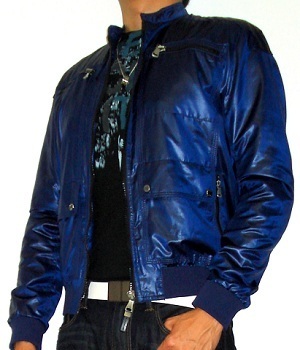 Photo #4 shows you a stylish outfit with a black graphic t-shirt inside a shiny Blue Polyester Jacket! Another effective way is you use either lots of white to accentuate some black or lots of black to accentuate some white. For example you can wear a black tee with black jeans and a white belt. 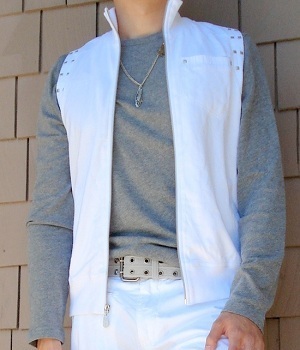 Or you can wear a white tee and a white pants with a black vest. All tones of skin colors look good in black. 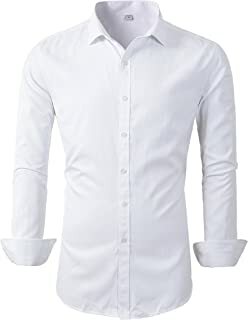 But if your skin color is charcoal black then I suggest you wear something lighter so that your whole image won't be too dark and heavy on the sight!